George Campbell Wynkoop was born on February 27th, 1806 near Brookford, Montgomery County, Maryland to Nicholas and Sara H. Campbell Wynkoop. He married Mary Ann Walker on March 24, 1831 at Orwigsburg, PA. They had thirteen children: Nicholas, Lieut. : b. Dec. 25, 1831: m. Almira Herman; Sarah Elizabeth: b. Mch. 27, 1833: d. Jan. 3, 1859: m. May 5, 1858, George Heebner; Helen Campbell: b. Feb. 27, 1835; Anna Maria: b. Feb. 18, 1837: m. James H. B. Warfield; Mary Pastrome: b. Dec., 1838: d. Dec. 8, 1841; Isabella Town: b. Sept. 1, 1840: m., Nov. 28, 1865, Charles Beck; Mary Anne: b. Apl. 2, 1842; Martha Washington: b. Feb. 22, 1844: m., Sept. 22, 1875, Jonathan Paxson; Frances Jane: b. Mch. 27, 1846: m. Joseph Paxson; George Campbell: b. in 1847: lived in Minersville, Schuylkill Co.; Clara A.: b. Jan. 27, 1851; Louisa Paxson: b. Dec. 31, 1852; William Hughes: b. Feb. 21, 1855. At the time of the outbreak of the Civil War, he was living in Pottsville, Pennsylvania. Because of his pre-war militia military experience, he received a 3 month commission as a Brigadier General of Pennsylvania Volunteers by Governor Curtin, April 19, 1861. 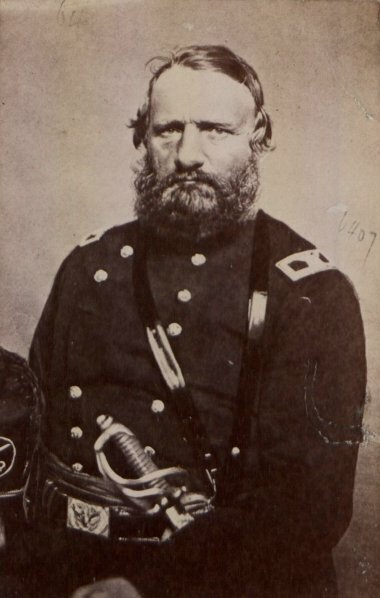 He took command of a brigade of Pennsylvania Volunteer Infantry, officially designated as the 2nd Brigade of General William Keim’s division in Major General Robert Patterson’s Department of Pennsylvania. On the 20th the 1st, 2nd and 3rd Regiments of Pennsylvania Volunteers were placed under his command, and he received orders to march to Cockeysville, Md. On the morning of the 21st, at 1 o'clock, the command left Harrisburg by railroad; arrived at Cockeysville at 10 o'clock, and went into camp. The same day General Wynkoop received orders from General Scott to march his command back to Pennsylvania. On the afternoon of the 22d, at 4 o'clock, he arrived at York, and went into camp. On the 19th of July, Gen. Wynkoop received orders from Gen. Patterson at Charlestown, Va., to march his command to Harrisburg, and have it mustered out. The General was mustered out, August 1, 1861. On the 21st of August, 1861, he commenced to raise the Seventh Pennsylvania Cavalry, and on the 18th of November received a commission as Colonel--term of service, three years. Many of the men in Wynkoop’s former command volunteered for service in the 7th Pennsylvania Cavalry. William Sipes, one of the men responsible for the recruitment of the regiment lobbied for the commissioning of George Wynkoop as Colonel. The placement was granted, Wynkoop receiving a Colonelcy in the United States Volunteers, commanding the 7th Pennsylvania Cavalry with William Sipes as his second in command.On the 18th of December he left with his Regiment for Louisville, Ky., and arrived there on the 25th. Left Louisville January 26, 1862, for Bardstown, Ky. Left Bardstown Feb. 27th, for Mumfordsville, and arrived there March 4th. Left March 11th for Nashville, Tenn., and arrived there on the 18th. Left Nashville, May 3, for Murfreesboro, by the way of Lebanon. Col. Wynkoop and his command reached Lebanon, May 5th, at 4, A. M., and attacked John Morgan and his command. The Seventh gallantly drove the rebels from the town to Carthage, a distance of twenty miles, where what was left of Morgan's band escaped by crossing the river in a boat. In this spirited encounter Col. Wynkoop captured 167 prisoners and 192 horses. On the 4th of August the Colonel had a skirmish with a large body of Forrest's cavalry at Sparta. After fighting half an hour the Colonel withdrew his men, and returned to join Gen. Nelson's command, ten miles in his rear. Col. Wynkoop had but 163 men with him. Forrest was 700 strong. On the 17th of August, with three companies of the Seventh, he left McMinville for Liberty, to join Gen. Johnson. Johnson's force consisted of the 2d Indiana, 5th Kentucky, two companies of the 4th Kentucky, and three companies of the 7th Pennsylvania Cavalry, making a total of 900 men. On the 21st of August Gen. Johnson attacked Morgan at Gallatin, and after a fight surrendered. Col. Wynkoop, however, determined that he would not surrender, and brought off 732 men and horses. His son, Lieutenant Nicholas Wynkoop was killed in action at Gallatin, Tennessee on August 21, 1862. He returned to Nashville where he arrived at 1 A. M., on the 22d. Wynkoop spent the remainder of his career in the Union army serving in this capacity. He was honorably discharged for disability on June 25, 1863, Lt. Col. William Sipes taking over command of the 7th Pennsylvania Cavalry. Wynkoop spent the remainder of his life in Pottsville, PA with his wife and family. He was elected town sheriff in 1867 on the Republican ticket. He died on September 29th, 1882 at 4 O’clock in the morning at his home, Morris Addition. He was buried in the Presbyterian Cemetery in Pottsville, PA on October 2nd, 1882. Source: Memorial of the Patriotism of Schuylkill County in the American Slaveholder's Rebellion; Wallace, Francis B.; 1865. Wynkoop in the largest collection of family trees online contributed by Ancestry.com users. Wynkoop in thousands of birth, marriage & death, church, immigration & naturalization, and Civil War service records and pension index. Wynkoop U.S. census records. The 1910 census lists Civil War survivors. Look for Wynkoop in historic PA newspapers. Articles may list battles, draft lists, soldiers returning home, lists of killed, injured, and POWs. Look for Wynkoop biographical sketches in historic Pennsylvania Family and Local History Books and Stories.